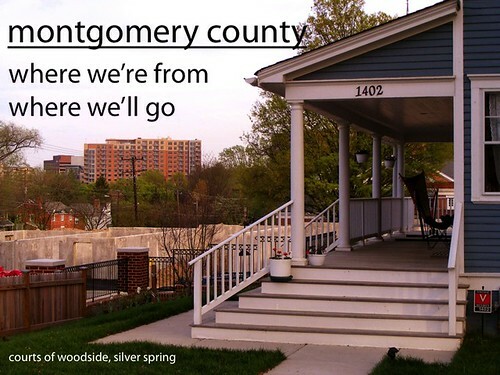 Last fall, I participated in the Planning Department's Pecha Kucha contest, in which you have to give a quick presentation on any topic (in this case, the future of Montgomery County) in twenty slides with twenty seconds for each slide. I was first to present and a little flustered after rushing to finish my presentation that morning AND driving straight from Philadelphia to Silver Spring to give it. I was rushed and out of breath and not as well-spoken as I thought I could be, but I figured it might be worthwhile to share it with y'all, a few months after the fact. The theme of my pecha kucha (it's Japanese and pronounced peh-CHAK-cha) was "Montgomery County: Where We've Been, Where We're Going." I used historic photos from Shorpy, mixed with new photos I've taken, to show how Montgomery County has changed over the past fifty years and how it'll change in the future. Most notable among those changes is the county's shift from being predominantly-white and rural (and later a bedroom suburb) to becoming majority-minority (the school system already is) and a mix of urban, suburban and rural place. There are many measures of diversity in Montgomery County, and I wanted to explore all of them. Of course, the winner of the Pecha Kucha contest was Planning Department intern and friend of JUTP Alex Hutchinson, who's guest-blogged here a couple of times now. You can see a video of his talk, and those of all of the other participants (all of whom, I later discovered, worked for the Planning Department) right here. This is good stuff -- I wish I had been able to attend the presentation you delivered in person. That pic of the duplex disguised as a single family home is great. I am going to show it to the folks working on the zoning rewrite -- many of them are horrified at the idea of accessory housing, duplexes, or anything that might accommodate increased density in existing residential neighborhoods. BTW, where is that jimmie cone place? Jimmie Cone has two locations in Mt. Airy and Damascus, where I've gone every summer since two summers ago. $1.66 for a small soft-serve with jimmies - you can't get that inside the Beltway, that's for sure.